This week the number of subscribers to my YouTube Channel passed the 20,000 milestone. This figure is the difference between the total number of subscribers (23,200) less those who have unsubscribed and de-activated accounts (3,190). My very first subscriber signed up to the channel on 28th September, 2009. The top four nations (according to YouTube Analytics) are as follows? I'm especially pleased to learn that I have so many subscribers from Ireland - I'm guessing (and hoping) that many of these are students of NCI. The United States provides by far the most subscribers - more than three times the next figure for the UK. God Bless America! 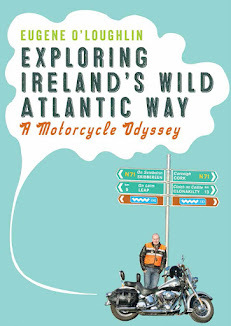 The largest lecture theatre in NCI is the Kelly Theatre which has capacity for 270 students. If I were to hold a lecture for the 20,000 YouTube subscribers I would have enough students to fill the Kelly Theatre 74 times! 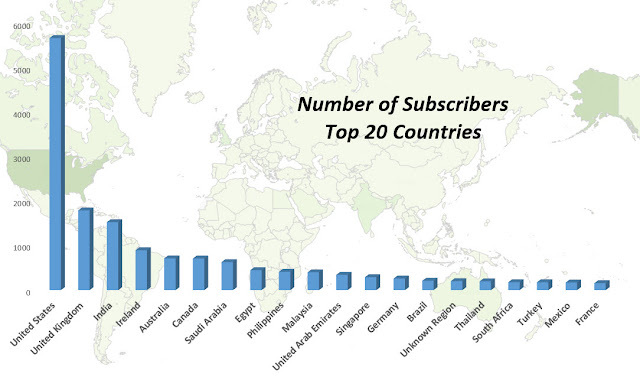 The bar chart below shows the top 20 countries by number of subscribers. The chart is done in Excel from data downloaded from my channel. I also added the data to Tableau as well to display a heat map of the world. It is not that effective for data like this because of the huge range between smallest and largest values, and the fact that the data are very much skewed as you see. I still used the Tableau heat map by inserting it as a partially transparent background image to the bar chart. A huge THANK YOU to all my subscribers - I do hope you all find my videos useful.